We’ve been calling it the end of an era for a long time now. It’s supposed to be the end of newspapers, according to naysayers who have been predicting their ultimate demise for years. But the facts prove the newspaper industry is growing and transforming rather than dying. Of course, there are always bumps in the road to innovation but, as it turns out, we’re actually in the midst of a promising and exciting time. We’re experimenting and transforming to match the pace of our innovative and digitally-driven world. Digital and bundled subscriptions accounted for a 5 percent uptick in circulation revenue in 2012 – the first national rise in circulation revenue since 2003. Newspaper content is now ubiquitous, available and accessed on every platform and device. Recent Scarborough research also shows that across all print, digital and mobile platforms, a full 70 percent of U.S. adults read newspaper content each week. That’s more than 164 million adults – 144 million of whom still pick up the print copy. And despite the common perception that the younger, digitally-native generation has abandoned newspapers, this study shows quite the opposite. Some 57 percent of young adults, ranging in age from 18 to 34, read newspaper content in a given week. This is a strong indication that the industry is still a relevant and vital source of information, even to Millennials, who coincidentally also contribute heavily to the growth of mobile readership, which jumped 58 percent over the last year. The reason for this is simple: With the deluge of information available on the Internet, people of all ages rely heavily on sources they trust to provide accurate content and quickly sift fact from fiction. 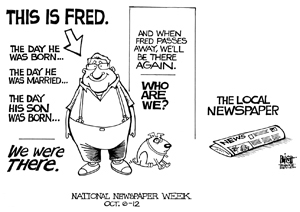 Newspapers consistently and reliably provide the most up-to-date, accurate and important news. And our audiences recognize this, rating newspapers as the most trusted of all media forms in a recent Nielsen study. While 56 percent say they trust newspapers, 52 percent trust local television and only 37 percent trust social media. Today’s technology has only proven how valuable this content is by providing a platform to widen the audience for each story, which can now be taken and repeated, shared, tweeted, condensed and e-mailed countless times a day. Newspapers have always been the cornerstone of our society, and that did not change with the digital revolution. Ever since the Philadelphia Evening Post first published the Declaration of Independence, our newspapers have continued to unite us as communities and as a nation. News media connects us through stories, keeping us informed on school board decisions, local heroes, national budgets and international conflict. The public’s right to know is essential to preserving our unique American democracy, and newspapers serve the vital role of independent watchdogs – keeping governments, businesses and other institutions in check. Without a free press that can protect its sources, American democracy will suffer. The newspaper industry will continue to innovate and transform with the times, just like any other industry. But one thing will never change: Our historic promise to connect, inform, investigate and foster an educated society. Caroline Little is president and CEO of the Newspaper Association of America, an Arlington, Va.-based trade organization, and a former publisher and CEO of WashingtonPost Newsweek Interactive.